This year, we were one of the lucky few commissioned to create a performance piece for Shrewsbury Folk Festival's exciting 'All Together Now' project! 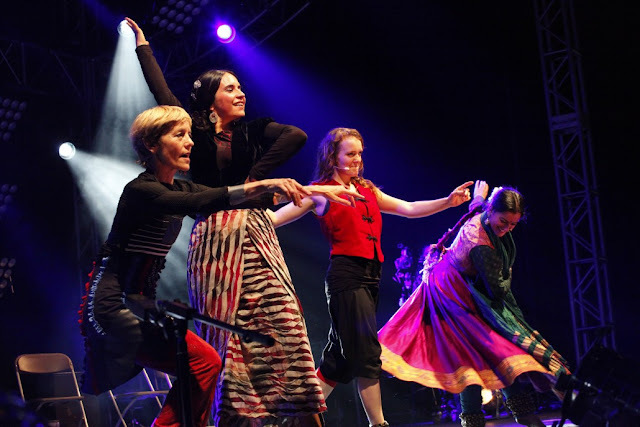 Collaborating with artists from all over the world we combined Kathak, Clog, Flamenco and African dance into a one time only performance, celebrating the rich cultures and art forms that exist in the UK. We recognise the power and impact that art can make on modern day life, and it was with this in mind that we set out to challenge negativity, division and hatred, and our performance could not have spoken louder! An incredible 10,000 online viewers joined our live audience of 2800 to watch as we proved that not only can cultures rub alongside each other, but work together to create new and beautiful ideas and art. We thoroughly enjoyed taking part and in this incredible opportunity, and hope you enjoyed it just as much as us. Wishing a HUGE thank you all of the musicians and dancers that we collaborated with, and of course a very special thank you to Shrewsbury Folk Festival for making this performance possible. We can't wait to see what you have in store for next year! Prepare yourself for a celebratory Mela of South Asian art and culture, as Lok Virsa returns this summer! Lok Virsa simply means ‘heritage of the people’. It is this beautiful simplicity that Sonia Sabri Company celebrates, bringing together the art of music, poetry, crafts and dance rooted in the lands of the Indian subcontinent. This event will go ‘beyond borders’, to remind it’s audience of unity despite modern borders and political differences. Artists originally from Pakistan will be sharing their love and passion for these art forms, bringing high quality and accessible arts right to your doorstep! These arts include: Music from Dhol Drummers, Vocalists, Miri Puri Music Group, Mushaira Poetry and various participatory activities in Dance, Arabic Calligraphy, Mehndi, Rangoli, Wood craft and Block Printing. So far Lok Virsa has been greatly recieved, with some incredibly positive feedback! We can’t wait help more communities re-discover the roots and ideas behind South Asian music, dance and visual arts through Pakistani culture. Upcoming Lok Virsa dates can be found on the ‘calendar’ section of our website. Click here to see a short video of Lok Virsa in action.